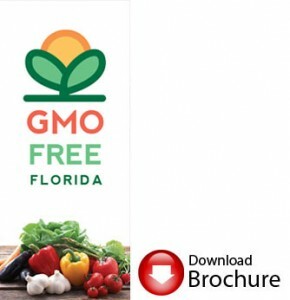 What does GMO Free Florida do? GMO Free Florida (#GMOFFL) is a grassroots organization that has been educating and organizing about the issue of GMOs since 2010. Our goal is to get mandatory labeling of GMOs and eventually ban the release of all GMOs into the environment. GMOFFL has upwards of 15,000 subscribers and works with many Florida organizations to help gather, thus far, over 20,000 signatures to label GMOs in Florida. These signatures and efforts from our group members played a major role in influencing Representatives and Senators to sponsor and co-sponsor bills in the Florida House and Senate to label GMOs –Most recently: House Bill 351, (Rep. Vasilinda) and Senate Bill 416, (Sen. Ring). These bills have been introduced in 2013-2015. Over the last few years, we have grown to 30 “Florida Right to Know” volunteer groups across our state. In combination with our groups and various organizations, we have helped organize events with over 10,000 people marching across Florida. We also create community events, speaking engagements, marches, rallies, film nights, pot lucks, support our local agriculture and farmers, and meet with elected officials. Some of our recent community successes have been inspiring local resolutions supporting GMO labeling that have passed in the City of Hallandale Beach, City of Miami Beach, Fort Lauderdale and Margate. In addition, GMOFFL and our affiliated groups have been instrumental in stalling the release of Genetically Modified Mosquitoes in the Florida Keys and helping create a demand for more farmers, food forests, permaculture and local agriculture across our state. ​GMOs, or “genetically modified organisms,” are plants or animals created through the gene splicing techniques of biotechnology (also called genetic engineering or transgenic). This experimental technology merges DNA from different species, creating unstable combinations of plant, animal, bacterial and viral genes that cannot occur in nature or through traditional crossbreeding. ​Virtually all commercial GMOs are engineered to withstand direct application of herbicide and/or to produce an insecticide. Despite two decades of biotech industry promises, none of the GMO traits currently on the market offer increased yield, drought tolerance, enhanced nutrition, or any other consumer benefit. ​The following crops are being genetically engineered for human consumption: corn, soybeans, canola, cottonseed, sugar beets, Hawaiian papaya, and small amounts of zucchini and yellow squash. An estimated that GMOs are in 70 to 75% of the processed food in America. ​ *In California over 6 million voters (48.6%) voted in favor of Prop 37, a ballot initiative to mandate the labelling of GMOS, despite $46.5 million spent to defeat it. *A 2010, Thomson Reuters PULSE™ Healthcare Survey, found that 93% of Americans believe that genetically engineered foods should be labeled. *GMO labeling has broad bipartisan support, according to a 2011 poll, 89% of Republicans, 90% of Independents and 93% of Democrats favor GMO labelling in the U.S.
​ *Already 64 countries around the world, including Russia, China, South Africa, Saudi Arabia, Japan, and all of the countries in the European Union, GMOs are either labeled or even banned. ​ *In the U.S., the government has approved GMOs based on studies conducted by the same corporations that created them and profit from their sale. Currently, there are no government mandated controlled studies demonstrating the short term or long term safety of GMOs. ​ *Under U.S. law, it’s difficult to conduct independent studies of GMOs because the seeds are patented and therefore unavailable for testing. Due to corporate influence, GMOs are essentially unregulated in America, with little federal oversight of their safety for human health or the environment. ​What are the health risks associated with GMOs? 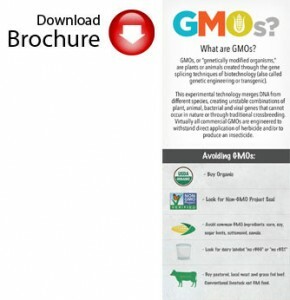 ​Over 80% of all GMOs grown worldwide are engineered for herbicide tolerance. As a result, use of toxic herbicides like Roundup has increased 15 times since GMOs were introduced in 1996. GMO crops are also responsible for the emergence of “super weeds” and “super bugs:’ which can only be killed with ever more toxic poisons like 2,4-D (a major ingredient in Agent Orange). The long-term impacts of GMOs are unknown, and once released into the environment these novel organisms cannot be recalled.